Something I've been working towards: incorporating meditation when ever possible. My goals is to make it a daily ritual for myself and my son. This morning, I need to take 10... Came across this really wonderful #Youtube "10 Minute Guided Meditation On Unblocking and Expanding Creativity | Epic - Uplifting - Healing". It was exactly what I was looking for! It was a guided mediation and a journey into the desert to play in this magical box. 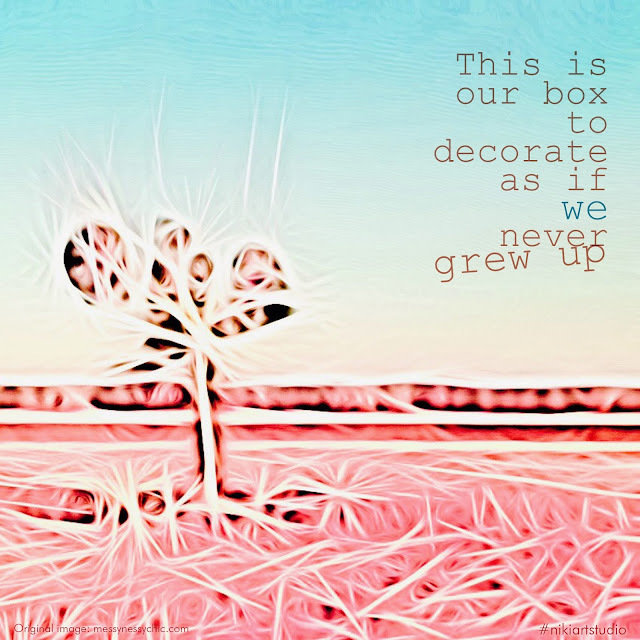 Got so inspired, I had to take 10 more minutes for some creative play with a line I got from the meditation: "This is our box to decorate as if we never grew up." I wanted to find a desert image on the web to mediate to and came across this one. I enjoyed taking a few moments for some creative play of my own to set the tone for the day. Feel free to use, share & re-post. Whether you are looking for a general 10 minute meditation, having a creative block, or having a moment where creative play would be a great impact to your day, I highly recommend checking out this video and adding it to your mediation play list. (I have). It just keeps getting better. Logging on to my Facebook today, an Artist & DJ - dj ffloodi posted a 'Happy Birthday Grace Jones - Love You to Life' redub tribute he made in honor of Grace Jones turning 67. Jones also shares her born day with Malcolm & Yuri Kochiyama. Some updates with me & this personal art blog: I've been experiencing a wonderful metamorphosis of sorts over the past year. It's great to feel that so many around me are also on this path of awakening, realizations, creative growth & progress in what ever journeys they are up to in life. As a Mom, Creative & Social Media manager - I'm juggling may things, but love it. I'm prepping for my annual month long exhibit, and assisting in a few passion project including poetry, art, design & social media. Co-working with creative co-conspirator & artist Alana DaCosta on a couple of community engagement & public art project that I will be sharing later on in the year. We are still in incubation mode with "What's Your Elephant", so much in store, I can't wait to share! As for this blog, check back next week as I have a few new "Creative Circle Tuesday's" scheduled to post.